I'm back tonight with my card for this weeks ColourQ. I just have to say these color brought back childhood memories. Lets see..the green was our carpet, the brown was our couch and the yellow was the kitchen floor and the star pattern on the countertops. Yes, I was born in the 70's..haha. Here are this week fabulous colours. All supplies PTI: Stamps Gracious Vases and Celebrations, Ink Summer Sunshine, Orange Zest, Simply Chartreuse and Dark Chocolate, paper Simply Chartreuse. Love your clean and simple card - the colors really pop, and the amount of white space makes it look very 2012, and not 1970! Deanna, your card is absolutely FABULOUS!!! I absolutely love it! Thank you so much for joining us again at the colourQ - it's such a pleasure to see what you create! I love the way you placed the sentiment on your card. Fabulous! this is so perfect!! just beautiful!! card.Much better than the 70's. Love the placement of the sentiment. Wow this is stunning. I love this. Which sentiment stamp did you use? i recognize the flowers from Papertrey, but I don't recognize that gorgeous Happy and birthday sentiment. Love it. Love these together and with these fun colors. Beautiful card, Deanna, I love the simplicity of this card. You rocked the colors. Thanks for joining us each week at the ColourQ and sharing your cards. Love the way you put the sentiment--it's very classy. This is the perfect card, and I am going to have to make one myself. I love those colors together, they bring back memories for me, too, although I was born before the 70's! Orange shag carpet that I had to rake every week for my mom! Love how you've got your sentiment perpendicular. It's a great look. i love this! i love the image placement and the perpendicular sentiment. Wow! I also enjoyed 70s decor Deanna! There's nothing 70s about this fabulously modern card though - I love the arrangement of vases on the word 'happy'! Great style!! Love the placement of your sentiments. It's very eye-catching. I love the design of this card, Deanna Jean! It's wonderful! This is fabulous. It's so striking and the colors look great together. Love the way you've stamped your sentiments. We had all of those colors together in one shag carpet in the 70s. Love it! :) Ann Y.
I just love the way you've tucked the vases perfectly into the corner, framed by the sentiment. Beautiful job with these colors and a gorgeous CAS design! Thanks for joining us this week at the ColourQ! I can see why there are 24 comments! This is CAS perfection!! Love it! We're so glad you played with the CQC this week! Congratulations, Deanna!! This is definitely a WINNER card. Just love how you did this. Congratulations! Your card is beautiful. Ugg my iPad wouldn't let me finish . 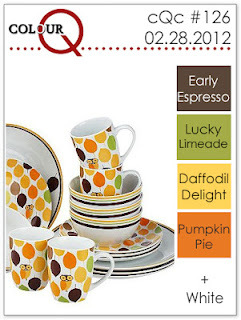 Congrats on your ColourQ win! I REALLY LOVE your design. 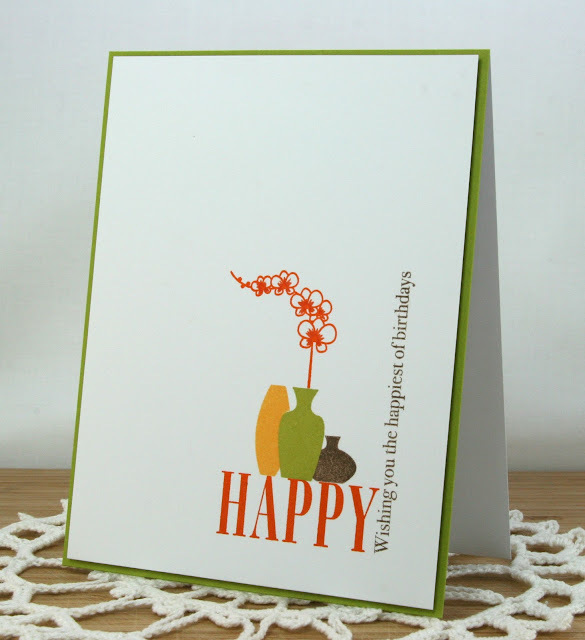 I love the composition of the vases atop the "HAPPY" and the vertical placement of the rest of the sentiment. I am going to have to CASE this one! Fabulous! Congratulations! your card is beautiful! Clean and simple I love it. Congratulations on your win Deanna. Your card is simply superb. Very eye catching and a stunning design in its simplicity. Brings back memories for me of the 70's when I was newly married and decorating my first house - orange curtains with bold shapes - oh the memories. 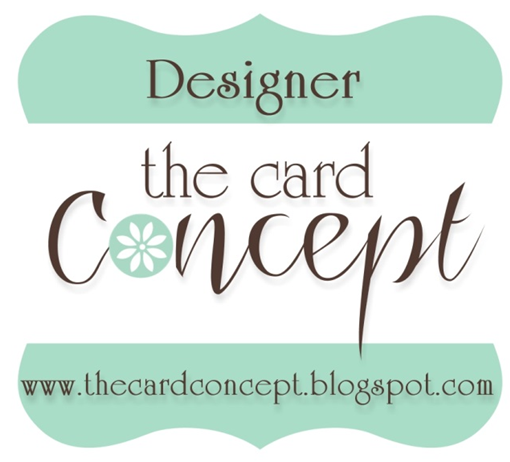 Your card is much better design! Congrats on being ColourQ Queen! Beautiful card! So simple and elegant! Stunning! 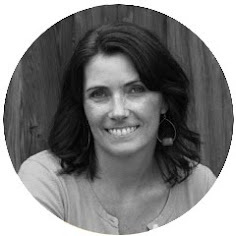 I love your style - just started following your blog!